So, in case you haven’t heard, a few days ago I purchased a new Gravity Bullseye Monster (yeesh, that name is heinous) from Bikesdirect.com, which makes my sixth purchase from that company. They just keep sucking me back in with their great deals and fairly high quality products. I can’t complain. As you’ve seen from a previous article of mine, my friend Jeff allowed me to test out his fat bike in the winter, and I was extremely impressed with their sure-footed-ness. Four inches of tire compared to the regular 2 inches you find on most mountain bikes makes quite a bit of traction difference. So, I had to have one to add to my fleet of bicycles. Today, I woke up, had some breakfast, and set out for Nasty Hill to see what I could do with my new fat bike. Cycling out felt very nice, very mountain-bike like, except more so (interpret that however you will). ;-) And then came Nasty Hill. I tried, I spun on on the loose rocks, I failed. I hiked-a-bike to the top and decided to try decreasing my tire pressure. The Vee Rubber tires that come with this bike are marked as 8 – 22 psi, and I set out today with about 16 psi. So I decreased down to 12 psi using my handy-dandy tire pressure gauge that I bought from Autozone. It’s one of those Slime brand, low pressure, internal-needle style gauges you can get for $5.99. I think they’re more accurate than the ones that look like a ball-point pen, and using them to deflate accurately is a breeze. Anyways, so I attempted to ascend Nasty Hill again, avoiding the loose rubble, and made it. Twice! I then attempted attacking the loose rubble section again, and spun out and failed. Well, there ya go. Low pressure plus avoiding the loose stuff on steep grades equals success. After heading back home, and doing a high speed descent on the asphalt road, I felt the gyroscope effect with the heavy tires / wheels on the turns which felt a little funny (Edit: after googling around for the cause of this odd issue, it was found that the tire type is most likely the cause of this “self steer” effect). All in all, this is a mountain bike that gives tons of extra traction and I really enjoyed myself. Next, I will be going on a longer trail ride with my buddies in the coming months. Stay tuned! Installing the rear rack and tire liners was flawless and easy! I am now ready to do some longer trail rides without fear of punctures. Almost forgot to add that the winter of 2016/2017 in southeast Idaho had the heaviest snowfall in several decades. And this bicycle came in extremely handy for commuting to work. I have a regular mountain bike with studded tires that works well on the icy streets which are oh-so-common in Pocatello winters, but this particular winter’s streets had a variety of snow pack on them for a good share of the winter season. Many times I woke up in the morning to all kind of deep, fluffy, churned up snow, for which this bike does fantastically on. It’s amazing how much difference 2 extra inches of tire width makes, especially when you deflate them down to the point of being semi-soft. Hello did you find that the 2×8 spd was pretty good? Would you think the 27 or 29 plus have a bigger advantage with the 24 spd? I am torn between the two. Hi Joe! I, also, was a bit leery about how well I’d like having a top gear combo of only 32T chainring and 11T cog on this bike. Needless to say, with off-road style bikes, I’m much more concerned about having a low enough gear, which this bike indeed does (22 in the front, 34 in the back). It is pretty easy to “top out” in the highest gear when going downhill; but, again, when down-hilling, I’m usually not even in top gear, and I’m more concerned with maneuvering well. For most road riding, the top gear is quite sufficient for commuting through town to get to your favorite trail-head. If I am planning on doing a lot of cross country -style riding, I’d probably hop on my triple-chainring mountain bike, for its 42 tooth chainring (and lighter weight). But I purchased this bike purely for having fun on trails and in the snow, so its gears meet those needs fine. 16-speed is plenty for me. :-) With some googling around, I discovered that most bicycles with 4-inch-plus wide tires are only going to have 2 chainrings due to the chain clearance issue (this is why the triple-chainring 27 and 29 bikes have less than 4 inches of tire). Hope this helps you out! Let me know if you have any other questions! I know this i san older post, but I was wondering would this bike be ok for a 300 lb rider? 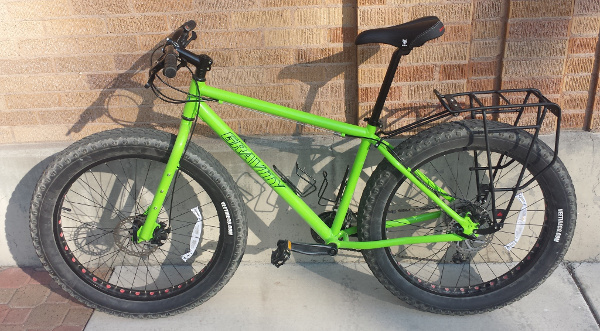 I am looking at inexpensive bikes and love the fat bikes! I live in te PNW and would like to use it for logging roads and to ride around with the youngsters. Hi Tony! I know a few heavy riders, and the only 2 breakage points I have heard of are breaking spokes and bending seat posts (which all seem to be made of aluminum). Wheels and spokes can be very durable if the wheel is built by a professional, and I would guess that fatter wheels for mountain bike and fat bikes would be more durable than skinnier ones. 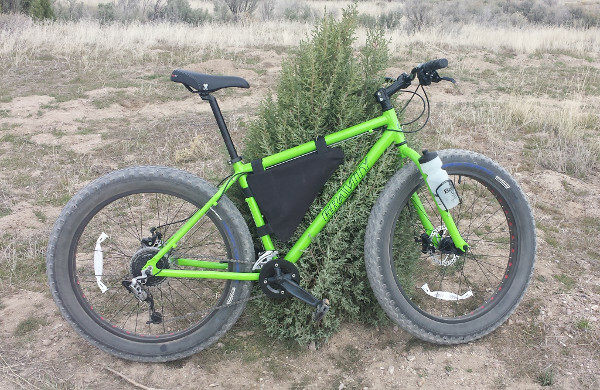 I am a pretty hefty rider myself at 215 lbs., and I’ve bounced my fat bike around on trails quite a bit. Nothing has busted yet! That’s as extensive a durability review as I can provide, haha. Good luck and happy cycling! Just ordered my Bullseye Monster and awaiting delivery. Can’t wait to get it in as I’ve order a couple add-ons for it already. Plenty of snow to ride in here in NH. Korey thanks for the reveiw! I’m just down the road in Victor and am planning on using it year-round for my 1.2 mile commute. Happy riding neighbor! !